Located in Lake Buena Vista (Bay Lake), Bay Lake Tower at Disney's Contemporary Resort is within a 10-minute walk of Walt Disney World® and Magic Kingdom® Park. This family-friendly resort is 4.8 mi (7.7 km) from Epcot® and 7 mi (11.2 km) from ESPN Wide World of Sports. Make yourself at home in one of the 428 air-conditioned rooms featuring microwaves and iPod docking stations. Rooms have private balconies or patios. Flat-screen televisions with satellite programming provide entertainment, while complimentary wireless Internet access keeps you connected. Bathrooms have shower/tub combinations and hair dryers. Take advantage of recreation opportunities such as a health club, or other amenities including complimentary wireless Internet access and concierge services. This resort also features babysitting/childcare (surcharge), an arcade/game room, and gift shops/newsstands. Spending a day of fun is easy with the complimentary theme park shuttle. Grab a bite to eat at one of the resort's 5 restaurants, or stay in and take advantage of the room service (during limited hours). Snacks are also available at the coffee shop/café. Quench your thirst with your favorite drink at the poolside bar. Breakfast is available for a fee. The preferred airport for Bay Lake Tower at Disney's Contemporary Resort is Orlando, FL (MCO-Orlando Intl.) - 26.6 km / 16.5 mi. 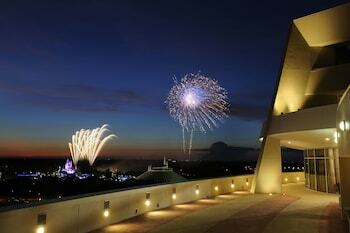 The preferred airport for Bay Lake Tower at Disney's Contemporary Resort is Orlando, FL (MCO-Orlando Intl. ).